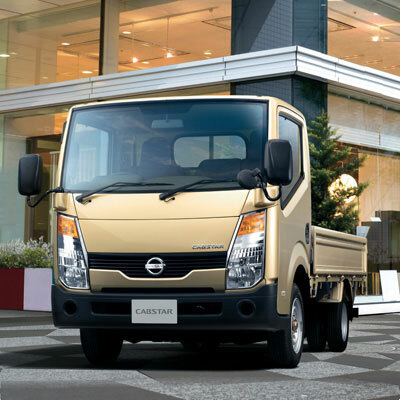 You're always ready to handle the toughest jobs with Nissan Cabstar. The big payload capacity lets you carry more per trip for extra time and cost savings. 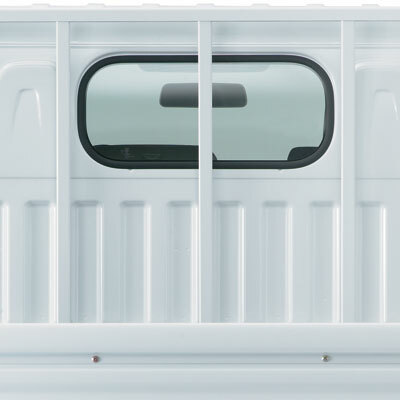 Take a close look and you'll see that the sturdy load bed has many useful features designed to facilitate the quick and easy transport of all kinds of cargo. 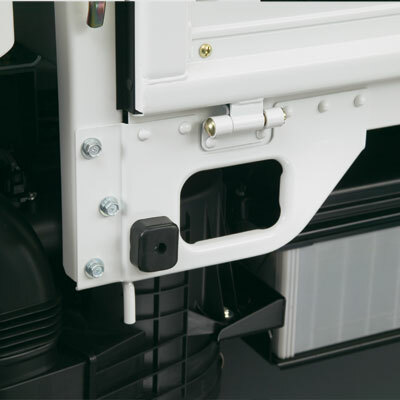 Quick exit and entry for the Cabstar has been made possible by lowering the height of the cab floor and doorsteps as well as by expanding the door opening range. 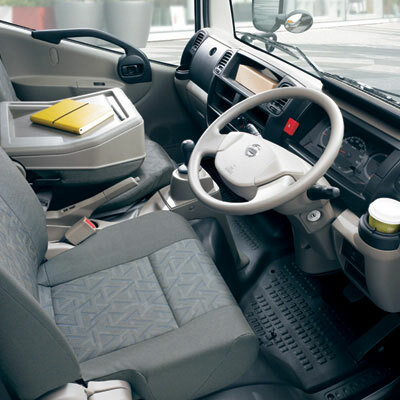 All of this allows the driver to get in and out easily and comfortably, reducing fatigue and increasing everyday work efficiency. 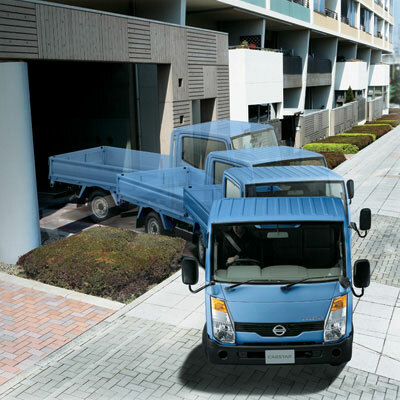 The Cabstar's anti-rust steel load bed is equipped with gates made of lightweight high-tensile steel for smooth opening and closing. The Cabstar's load bed comes with a load bed step that is set low to make it easy for users to get on and off the load bed. 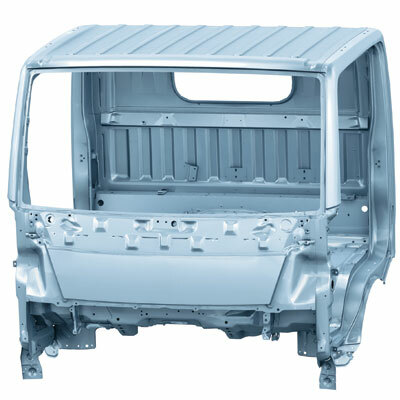 The load bed's protective frame shields the cab should the cargo shift forward. The Cabstar's load bed comes with 3 rope hooks that can hold up to 3 ropes. 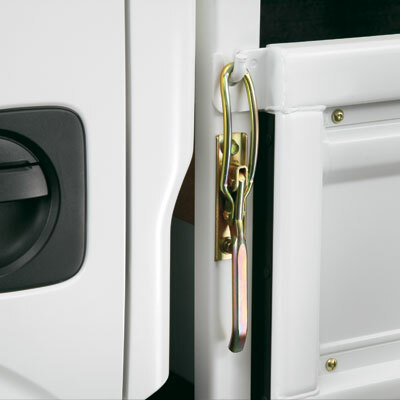 The Cabstar features a side gate lock with catch that has a large handle for easy operation for the load bed. 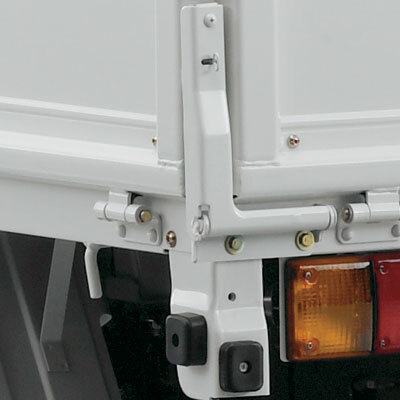 Large gate supports for the Cabstar's load bed supports both the side and rear gates securely. 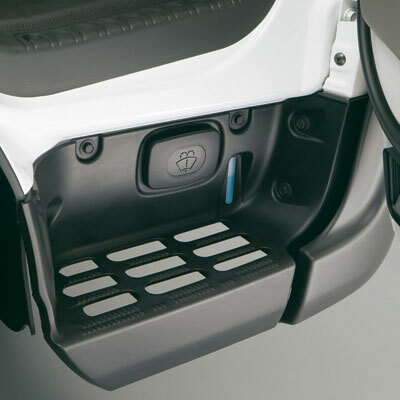 The Cabstar comes with a driver's side doorstep that is large and has a slip-prevention design. It is set low to allow you to get in and out easily. Available to lock and unlock the doors by remote control, giving you quicker and more convenient access. 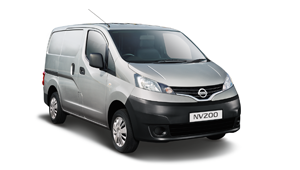 Provides easy access to the engine compartment and a wider working space for maintanence. 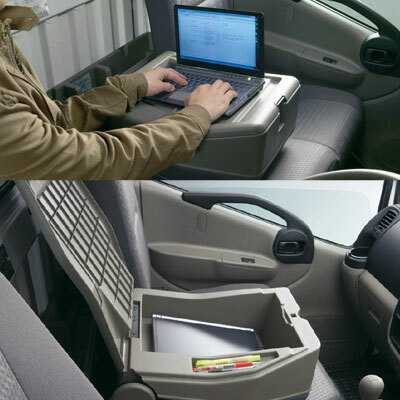 You will find plenty of room in the Cabstar's cabin to store all the documents, road maps and so on that you need to keep your business on the move. The driver-oriented design is evident in features such as temperature controlled cup holders and comfortably designed seats. 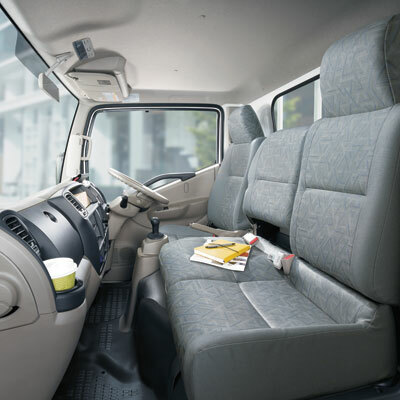 The large cabin space in the Cabstar provides a comfortable environment. Both the height and the depth of the cabin have been expanded, giving you more room above your head and more space below to stretch out your legs. Steeply angled front pillars give you a wider view and better side visibility. The Cabstar's comfortably designed seats provide excellent support, holding you firmly and helping you maintain a stable posture. You can have the most optimum driving position with the tilt-and-telescopic steering wheel in combination with a reclining and sliding driver's seat. The steering wheel can be adjusted in the up-down and back-forth directions. 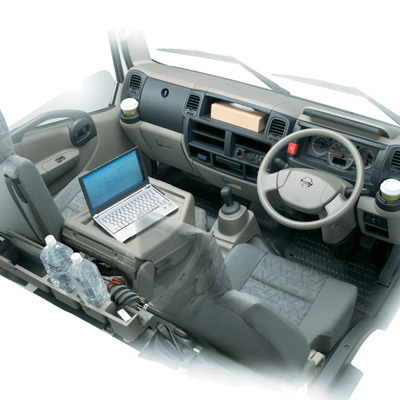 The center passenger seatback in the Cabstar's cabin folds forward to create a useful flat workspace. It is also a large storage box in which valuables can be stored safely. 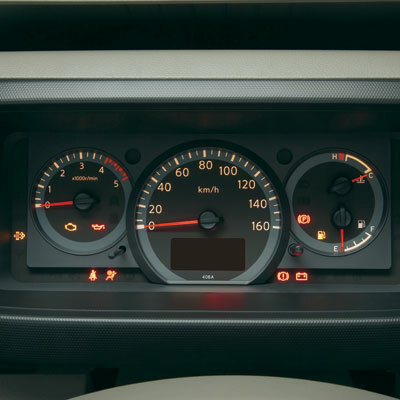 Cabstar's easy-to-read meters show you everything you need to know, including driving distance, driving time, momentary fuel consumption and maintenance timing. The multi-purpose box in the back of the cabin is perfect for storing things like umbrellas, flashlights, and larger plastic bottles. It can be accessed simply by reaching across the center seat. 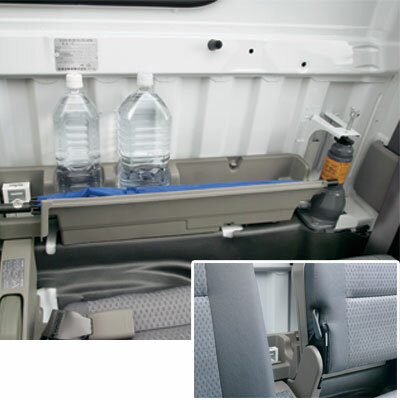 The Cabstar comes with plenty of storage solutions such as a large upper box, two 1DIN boxes, a center box on the dashboard, lower and upper instrument-panel tray, overhead tray, center lower box, a large glove box and 2 cup holders for driver and passenger. 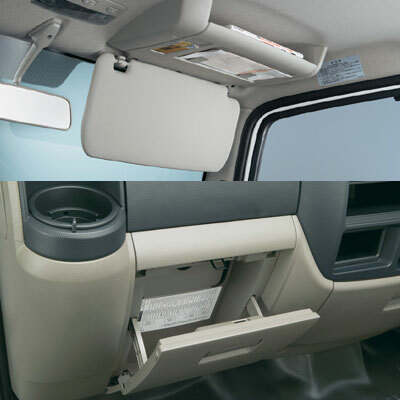 Airflow from the air-conditioning is sent to the insides of the cup holders to keep drinks cool. 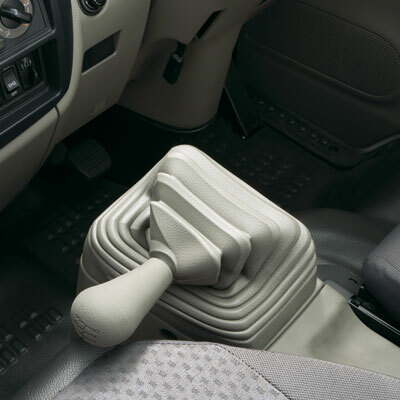 Moving between driver's and passenger's seats is easy thanks to the collapsible shift lever, parking brake and a large foot space. 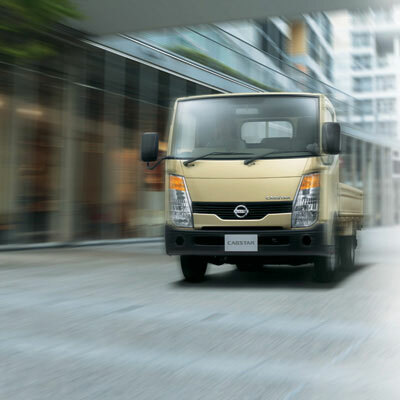 All round productivity shifts into top diesel as the Nissan Cabstar with its potent ZD30DDTi engine makes easy works of the most demanding jobs. Powerful ZD30DDTi diesel engine that powers the Cabstar is equipped with a direct-injection DOHC 16-valve intercooled turbocharger. 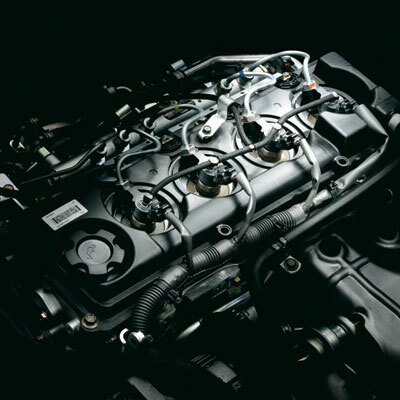 This high-performance diesel engine delivers excellent fuel economy without compromising high power and high torque. A common-rail high-pressure fuel injection system and cooled EGR (Exhaust Gas Re-circulation) system ensure smooth running and clean emission gas. It is equipped with an advanced DPF (Diesel Particulate Filter) system. 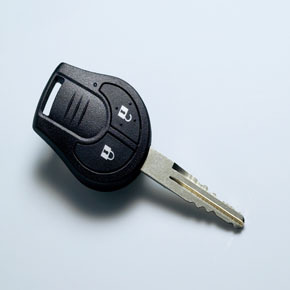 A manual switch lets you activate the DPF to burn off excess soot for a lower vehicle emission level when necessary. 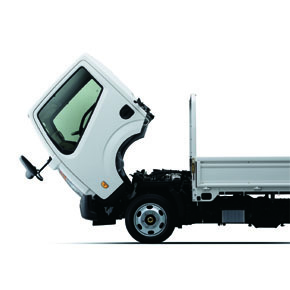 The Cabstar achieves a minimum turning radius that's at the top of its class, while offering excellent manoeuvrability. 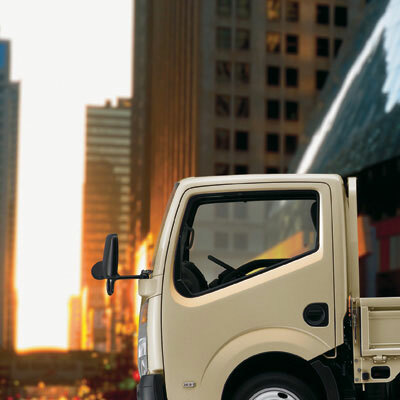 Even on tight city streets, the Cabstar is a versatile vehicle that makes parking and U-turns a snap, maximizing your mobility in inner-city deliveries and letting you get the job done faster than ever. The Cabstar uses double wishbone independent suspension for the front, that gently absorbs shocks from road surfaces to achieve excellent running stability and comfortable riding. Increased roll resistance ensures remarkable maneuverability on rough roads and when cornering. 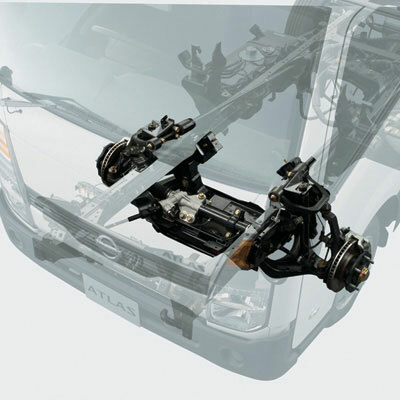 Rigid suspension is utilized for the rear. 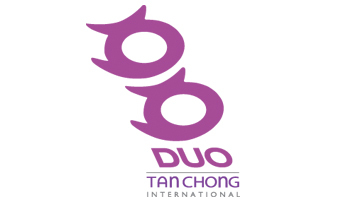 Superb rigidity and durability ensure high running stability whether the bed is loaded or not. 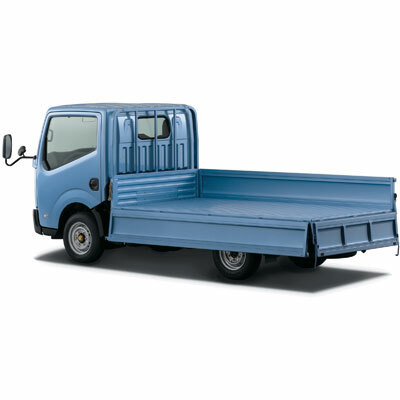 It provides excellent support for the cargo when loaded and offers comfortable riding when there is none. 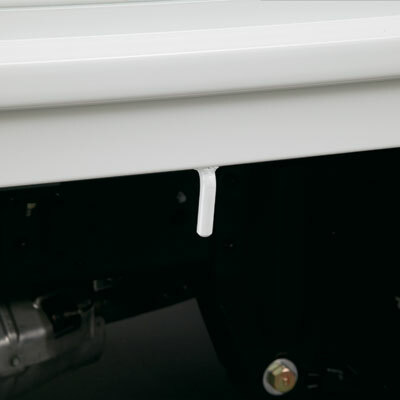 Liquid-filled cab suspension keeps the cabin quiet and comfortable while effectively supressing vibrations and noise from the road surface. 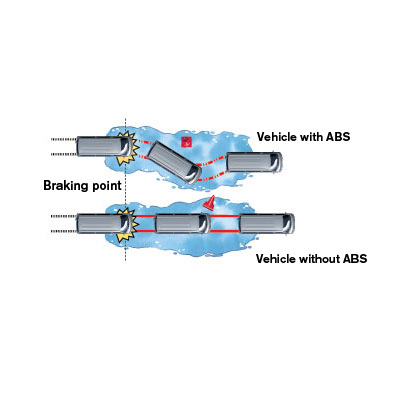 In combination with the front and rear suspension, this ensures a smooth, gentle ride. 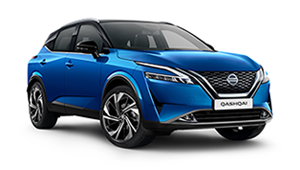 In the area of safety technology, Nissan pursues innovation as part of its "Safety Shield" concept, an advanced, proactive approach to safety issues based on the idea that cars should help protect people. This approach provides various measures to help the driver and passengers better avoid dangers in ways that are optimized to each of a wide range of circumstances that the vehicle may be in, from "risk has not yet appeared" to "post-crash". 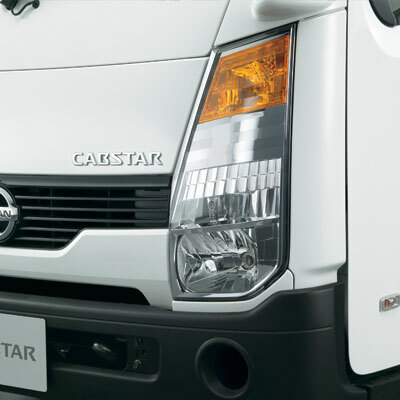 The headlamps on the Cabstar are multi-reflector halogen headlamps for excellent light distribution. 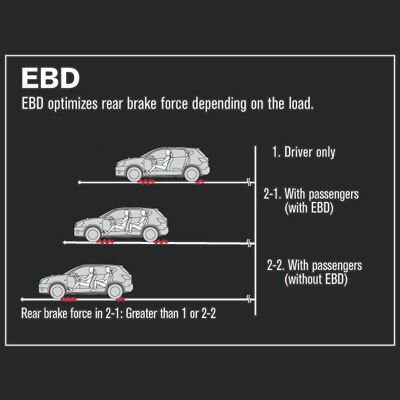 While the weight of more passengers and cargo inevitably increase braking distance, Cabstar's EBD (Electronic Brake-force Distribution) system serves to reduce the braking distance by sensing the load carried and redistributing the braking force in the front and rear for more effective braking. 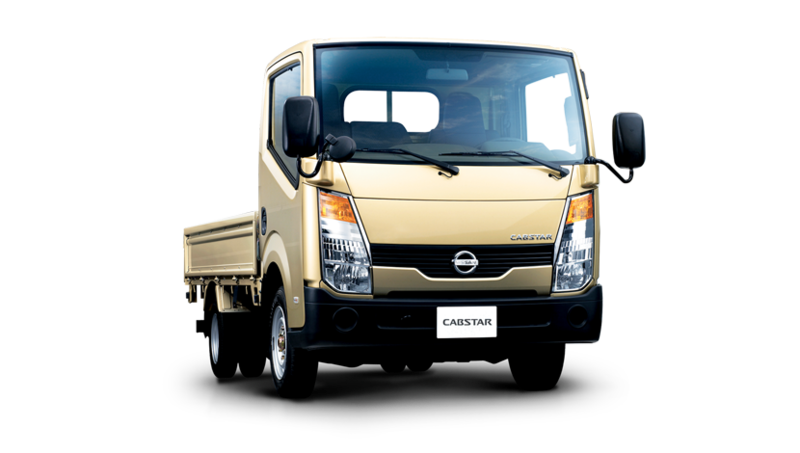 Cabstar's highly rigid yet lightweight cab frame comes with improved durability. Its newly designed door beams also helps minimize cabin deformation and to absorb impact in the case of a collision from an oblique angle. 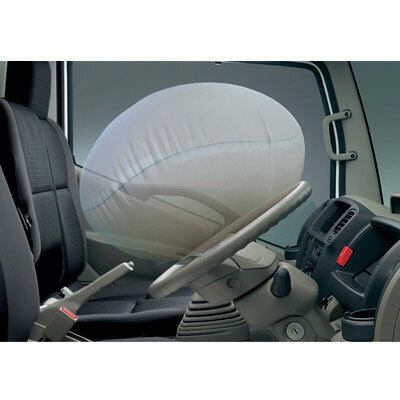 The driver's SRS Airbag help to reduce the risk of injury from an impact.